"Seeing in a different light"
Growth in our Federation is vital if we are to survive and flourish, and there are many initiatives in hand at the moment, spearheaded by energetic and committed Brethren to found new Triangles and to grow recently formed ones. Below is a progress report on our six Craft Triangles. A Triangle is, in effect, an embryonic Lodge, without the necessary minimum number of M∴M∴s to be consecrated as such. Hence they cannot confer degrees, and when a candidate comes forward, the MPGC or another member of the Triangle of the 33° must confer the degree on behalf of the Triangle. The Kenilworth Golf Club in Kenilworth, Warwickshire, is the meeting place for the new fledgling Triangle. Their inaugural meeting was held on 13 January when they interviewed their first candidate.New applicants are welcome. All went well and that their first initiation will took place in February. The name of the Triangle is Love and Unity and their motto will be ‘We are all one divine image of your reflection’. Two esoterically minded people from this town were keen to become Freemasons. They are a couple in their early thirties who want to be initiated and establish a triangle in Scotland, the first LDH presence there for quite a few years since Lodge Osiris went into abeyance. They have been interviewed and later initiated at a special lodge meeting at Hexagon House on 9 February. There will then be publicity and marketing initiatives in their home town and surrounding area to attract others who might wish to be involved in the formation of a triangle. A male applicant from Norwich, not just content with being initiated into an existing lodge, is keen to become a member of the British Federation and spread the light of Freemasonry for Men and Women in East Anglia, by finding other like-minded people local to him and working with them to form a triangle. He has been interviewed and now initiated along with others at a special event in February. As a result of the above three initiatives, a special meeting was held at Hexagon House on Saturday 9 February in order to initiate applicants from the three above embryo Triangles. The Consistory sought the help of AIM members and provide officers to conduct this ceremony. On Thursday 29 November the Brighton & Hove Triangle was consecrated at the Village Hall, Ovingdean, Brighton. The Triangle first met in January 2018. One or two Brethren had been discussing the idea of re-establishing a Droit Humain presence in Brighton and Hove for a year or so but it wasn’t until August 2017 that a plan was agreed. The first step was to find suitable premises which was not easy. Eventually, by November 2017, they had found a Jewish Community Centre in Hove who were happy to let them meet there. They subsequently decided to move to the Ovingdean Village Hall in April 2018. They have now had requests from two non- masons as applicants and both have now been initiated. Y Ddraig Triangle meets in Chipping Sodbury in the Orient of South Gloucestershire, and are planning to form a Lodge within the coming twelve months. While still small in numbers, its members are hugely committed to the success of this Triangle. They conducted an initiation and a passing in November – no mean feat in one day, but helped by members from Hexagon House, it proved to be a very enjoyable day. The fact of having to set up the Temple each time is proving to be useful instruction for younger members. They have had a range of enquiries over the year although, as ever, Freemasonry is not right for everybody and so they keep looking for more enquirers and symbolically open their doors – and always their hearts – to those who are genuine seekers and willing to join them. The Triangle is planning an Open Day for 2019. Meetings are on the third Saturday of the month and the Triangle welcomes visitors from other lodges. The name of the Triangle - Tir Na nÓg or Tir na hOige - means ‘Land of the Young’ or ‘Land of Youth’ in Old Irish. This is a revival of an old Lodge of the British Federation which went into abeyance and a distinctive feature of the Triangle is the working of the Irish Ritual, an ancient Masonic ritual which predates the Emulation ritual of 1816. Interestingly, the congenial venue of the Triangle is the Civil Service Club in the heart of London’s Westminster, which promises to make this Triangle an ideal Lodge for visiting members of other Federations of Le Droit Humain as well as other masonic Orders in amity with the British Federation. This is a Triangle which attracts people from very diverse backgrounds and disciplines, united in their common interest in esoteric subjects and the role of Freemasonry in the Western Mystery Tradition. The Triangle has five members and three candidates awaiting Initiation which is very exciting. It will soon become a fully fledged Lodge which, given its central London location, we hope will showcase the esoteric and spiritual model of Freemasonry practised by the British Federation of Le Droit Humain. Freemasonry is actually not secret. We are happy to discuss most aspects of Freemasonry. What we will not discuss with non-masons are the details of the ceremonies, as to do so would blunt the impact for those wishing to join. As with any society, our proceedings are private. Many books have been written about Freemasonry over the centuries and continue to be written. These books cover all aspects of Freemasonry and will show you all aspects of the ritual and the workings of Freemasonry. You can buy a complete book of the ritual of the degree ceremonies. But that would not facilitate your reception into Freemasonry, because you can’t become a Freemason by reading about it; you can only become a Freemason by experiencing it. So the supposed secrecy about Freemasonry frankly does not exist. Are there any famous Freemasons? Throughout our recorded history, at least since the 17thC, many prominent and influential people in the arts, sciences, philosophies, politics, literature have been Freemasons. Alexander Fleming, who discovered penicillin, King George VI, George Washington, Benjamin Franklin, Josephine de Beauharnais, Mark Twain (‘Courage is not the absence of fear but the mastery of fear’), Elias Ashmole, Goethe, Mozart, Voltaire, William Hogarth, Gustave Eiffel, Garibaldi, Dr. Barnardo, Henry Ford, Josephine Baker, Buzz Aldrin, Winston Churchill, Cecil B. de Mille, Douglas Fairbanks, Clark Gable, Harry Houdini, Peter Sellers, Al Jolson, Lord Kitchener, Rudyard Kipling, Oscar Wilde, Martin Luther King, Louis Armstrong, Theodore Roosevelt, Gerald Ford and many more. If I join, will I make friends? Will it help my career? You would almost certainly make friends, for you would be among like-minded people who probably share your views and interests. That is not to say you would agree with them on every level. The friends you would make amongst Freemasons would engage in lively debate; engaging with them would probably stimulate your intellect. Freemasons engage with each other on many levels, and tolerance, courtesy and harmony always characterise our dealings with each other. Freemasonry will never directly help your career. There is no such thing as giving one another a ‘leg up’ or possibility of promotion because of membership. But it is perfectly possible that Freemasonry will so aid you on the path to spiritual growth and development that you will become a more all-round person in yourself, thereby fitting you for the daily tasks that your profession or career demand of you. Is it true that I have to roll up my trouser leg? No. When a candidate is prepared for initiation, his or her clothing is discreetly disarranged to denote, in an allegorical fashion, the frailty of the human condition. organisations. Each member also promises to keep confidential the traditional methods of proving he is a Freemason which he would use when visiting a Lodge where he is not known. Members also undertake not to make use of their membership for personal gain or advancement. Isn’t ritual out of place in modern society? than if they were simply passed on to him in matter-of-fact modern language. What are the ceremonies of Freemasonry about? Briefly, each degree conferred is conducted as a drama, like a mystery play. Each one of the three is in two parts - the first part relates to the conferral of the degree itself, the second part consists of a legend and instruction in the duties conferred by the first part. The first degree may be regarded as an allegory of birth - birth of the spirit, or the attainment of inner light and self-knowledge. The second degree is an allegory of life, or the journey we all undertake between birth and death, and concentrates on intellectual growth. The third degree explores the allegory of the death of the old person to be reborn to a higher state of consciousness. Membership of a lodge is open to men and women of all faiths and of none, who are law-abiding and of good character. Freemasonry is a multi-racial and multi-cultural organisation. It has attracted persons of goodwill from all sectors of the community. Are only men admitted to Freemasonry? Both men and women are admitted to the Order in total equality and total harmony. Unlike other masonic Orders, we make no distinction whatsoever. Do Freemasons claim to be better people than non-masons? No. Freemasons seek ways to self-knowledge and to achieve progress in virtue and in moral awareness and uprightness, but would never claim to be better than other people. Are Freemasons expected to prefer fellow Masons at the expense of others in giving jobs, promotions, contracts and the like? Absolutely not. That would be a misuse of membership and is not allowed. Can I improve my career prospects by becoming a Freemason? You should never attempt to use your membership of Freemasonry to improve business or career prospects - if you did, any Freemason who suspected that you were trying to do so would immediately be alienated, since it is totally against the ethos and spirit of Freemasonry. I have heard it said that Freemasons conspire against the state and that they aim to take over the world. Is that true? There is no truth in that assertion whatsoever; in fact, each person on being initiated is enjoined to be exemplary in the discharge of hs civil duties and faithful to the laws of any country in which he lives, and not to plot against the state, as such action would result in his being expelled from Freemasonry. Isn’t it true that Freemasons only look after each other? No. From its earliest days, Freemasonry has been involved in charitable activities. Freemasonry has always provided support not only for widows and orphans of Freemasons but also for many others within the community. On a local level, lodges give substantial support to local causes. Is it true that Freemasonry had its origins in ancient Egypt? Probably not. What is true is that the precepts and practices of Freemasonry mirror many ancient mysteries and belief-systems, from the dawn of history, through medieval times, the Renaissance, the Age of Enlightenment and many other strands of learning and culture. So when and where did Freemasonry originate? Freemasonry goes back to the medieval stonemasons, who were engaged in the construction of the many sublime examples of architecture in England, particularly churches and cathedrals. This theory has it that such stonemasons introduced means of protecting their craft in each area from itinerant or immigrant workers, who might have undercut the wages offered, or taken work that belonged to the local workers. The stonemasons engaged in the construction of such buildings often organised themselves into Lodges, and elected men to lead them and provide guidance in the work. Why don’t some churches like Freemasonry? There are elements within certain churches who misunderstand Freemasonry and confuse secular rituals with religious liturgy. Although the Methodist Conference and the General Synod of the Anglican Church have occasionally criticised Freemasonry, in both Churches there are many Masons. Why will Freemasonry not accept Roman Catholics? It does. How a candidate’s belief is expressed is entirely up to him or her. Isn’t Freemasonry just another political pressure group? Emphatically not. Whilst individual Freemasons will have their own views on politics and state policy, Freemasonry as a body will never express a view on either. The discussion of politics at Masonic meetings has always been prohibited. No. 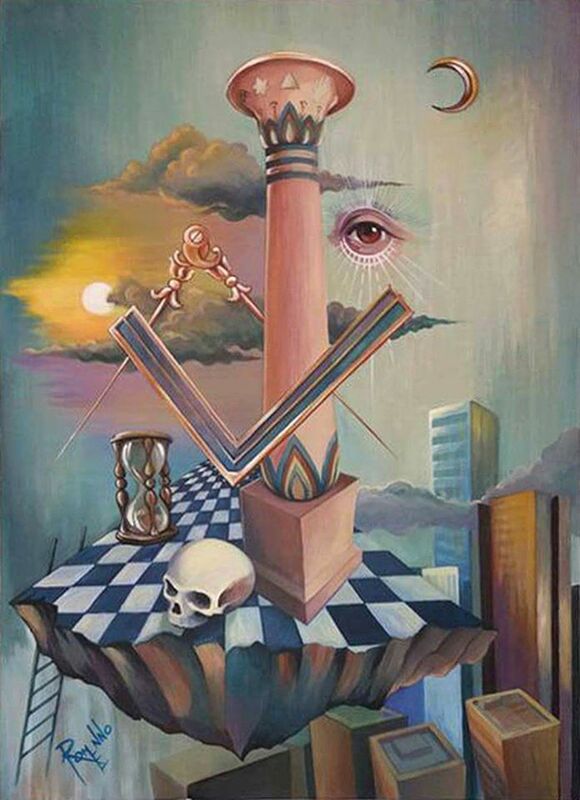 Freemasonry is a spiritual pursuit, leading to self-knowledge and moral growth, and can be said to underpin the individual Freemason's religious adherence if he has one, but Freemasonry has no theology and does not teach any route to salvation in the way that institutional religions do. Discussion of religion is not permitted in Lodge meetings. What about religion and God? Freemasonry is not a religion. It does not offer sacraments or salvation in the sense employed by many world religions. Freemasonry has no dogma and does not direct what you should believe or practise beyond the masonic ritual. It is a spiritual path, one which may be travelled at your own pace, and one whose aim is to actively assist the Freemason in his or her pursuit of self-knowledge, spiritual and moral growth and development, thereby enabling him to achieve his own inner building. This, if successful, will then enable him to take part in the building of an edifice with his members in the Lodge, ultimately leading to the building of an edifice to humanity leading to the establishment and maintenance of a better world. Freemasons acknowledge the existence of a Creative Principle, designated by some as the Supreme Being, and referred to by many Freemasons as the Great Architect of the Universe. "Withdraw within yourself, and examine yourself. If you do not yet therein discover beauty, do as the artist, who cuts off, polishes, purifies until he has adorned his statue with all the marks of beauty. Remove from your soul, therefore, all that is superfluous, straighten out all that is crooked, purify and illuminate what is obscure, and do not cease perfecting your statue until the divine resplendence of virtue shines forth upon your sight"
1. understood by or meant for only the select few who have special knowledge or interest; recondite: poetry full of esoteric allusions. 2. belonging to the select few. 4. (of a philosophical doctrine or the like) intended to be revealed only to the initiates of a group: the esoteric doctrines of Pythagoras." For notification of our Newsletter and Public Events. * Previously known as the International Order of Co-Freemasonry.